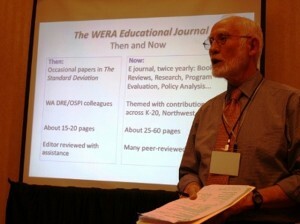 WERA has two publications, the peer-reviewed WERA Educational Journal (WEJ) andThe Standard Deviation, the association’s newsletter. Guidelines for submitting materials for these publications are provided on WERA’s website. WERA also sponsors white-papers on relevant topics of interest. The WEJ is published twice per year and contains academic papers, professional reports, and commentary of general significance to the Northwest education research and practitioner community. WEJ encourages submissions of three types of research articles—feature articles, reviews/essays, and briefs. In addition, WEJ publishes commentary articles such as reviews, letters to the editor and essays. Manuscripts are reviewed by at least two peers who are appropriate for the topic and content of the article submitted. The Standard Deviation is published three times per year and includes short articles on key topics, summaries of keynote presentations at WERA conferences, and updates on WERA activities.